In interview on Israeli TV, PA chairman says he still sees Netanyahu as partner for peace, denounces current terror wave against Israelis. Palestinian Authority (PA) chairman Mahmoud Abbas said Thursday that he still sees Prime Minister Binyamin Netanyahu as a partner for peace. Speaking to journalist Ilana Dayan on Channel 2’s “Uvda” program, Abbas also claimed that the PA’s security forces fight terrorism and go as far as to search backpacks of Palestinian children for knives that can be used for stabbing attacks. A 15-year-old child who takes a knife and goes out to kill Israelis does it “because he has no hope”, claimed the PA chairman. “We never lost our humanity. We need to say that what is happening is unusual. Something that must not continue. It’s unnatural, contrary to human nature, contrary to our nature as Palestinians and to yours as Israelis. If we accept the status quo, we will not have a future. We want to look to the future. The future is peace,” said Abbas. The PA chairman also said he would be willing to meet Netanyahu “anytime and anyplace” if Netanyahu invites him to a meeting. “I still reach out to Mr. Netanyahu because I believe in peace. I believe that the Israeli people want peace and the Palestinian people want peace. Either we politicians do it, or we leave it to the people. They will do it in a week,” he added. 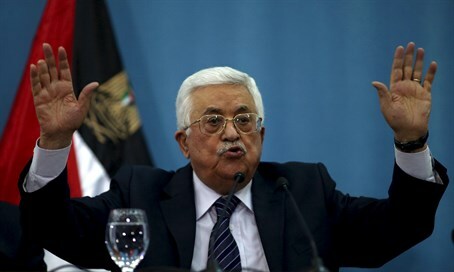 Despite his remarks, Abbas reportedly recently rejected a new peace plan outlined by visiting U.S. Vice President Joe Biden. According to the Palestinian Al-Quds newspaper, Biden’s initiative would have included dividing Jerusalem and a total freeze on Israeli "settlement building" in Judea, Samaria and Jerusalem. Abbas also admitted last November that he rejected "out of hand" an offer by then-Prime Minister Ehud Olmert for a PA state on nearly 95% of Judea and Samaria. Asked about the talks with Olmert in the interview with Dayan, Abbas admitted that he and Olmert were “very close” to reaching an agreement but it did not go through due to Olmert’s corruption trial.